Does Caffeine Affect Testosterone Levels? You want to get the best from your workouts – and that means you need to get fired up ready to work hard. Your session is like a war. Just you against the weights room. This is where caffeine steps in. It boosts energy, strength and power. And if that’s not enough, it also stimulates fatty acid breakdown too. It boosts your physical performance, but can it boost testosterone too? Or does it have a negative effect on your male hormones levels? Caffeine is from a family of compounds called purines. It is extracted from natural sources such as plants, or synthesized directly from uric acid in a laboratory. As a naturally occurring alkaline, you’ll find in coffee, tea, cacao, guarana and kola nut. Some sodas, chocolate, diet pills and pre-workout supplements also contain caffeine and you can find it in pharmacological products too. It is often used by medical practitioners as a cardiac and respiratory stimulant for example. How Does It Improve Performance? Caffeine is a potent supplement for physical performance. It has stimulatory effects that improve endurance, power output, reaction time and cardiovascular function. In fact, caffeine is such a potent compound that the World Anti-doping Agency are monitoring its use in athletes (it’s not a banned substance by any means though). Caffeine is a nootropic – a substance that stimulates and enhances cognitive performance. It boosts focus, mood and improves alertness . It does this by increasing levels of neurotransmitters in the brain. These are chemicals that relay messages from your central nervous system to your body. They include norepinephrine, dopamine, serotonin and epinephrine. There are a number of proposed mechanisms for caffeine’s ability to get you worked up prior to a workout. All of these are based around the central nervous system and neurotransmitters. 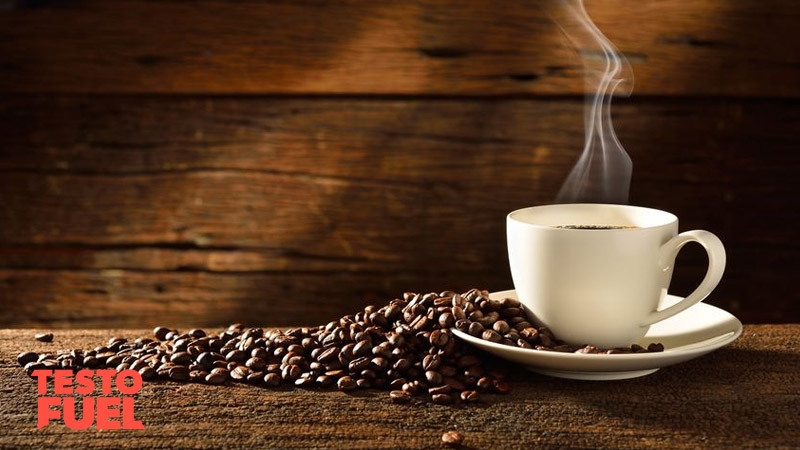 Firstly, it has been suggested that caffeine can inhibit your adenosine receptors . When fully functioning, the neurotransmitter adenosine keeps us calm, relaxed and to an extent sleepy. When inhibited by caffeine it switches these chemical messages off, making you more alert and focused. Another mechanism will inhibit enzymes that regulate cyclic adenosine monophosphate (cAMP) – another chemical messenger that controls the central nervous system. It is these mechanisms that may play an important role on how caffeine can affect testosterone levels. Caffeine increases levels of cortisol – a hormone that is triggered by physical of emotional stress. We need it in small amounts as it helps to break down stored energy. But in large amounts it can have a negative effect on health. Cortisol can elevate your blood pressure, can contribute towards inflammation and high cholesterol. It is a potent trigger for mental illness such as depression and low resilience too. How does it affect your physique? The hormone also increases belly fat, contributes towards obesity and eats away at your muscle levels too. And it does this as it directly opposed testosterone – if testosterone is the gas, cortisol is definitely the brake. Why do you need to know this? Well any stimulant that increases your heart rate and central nervous system response increases stress. And of course caffeine is a stimulant. So if it boosts cortisol then it’ll have a negative effect on testosterone, right? 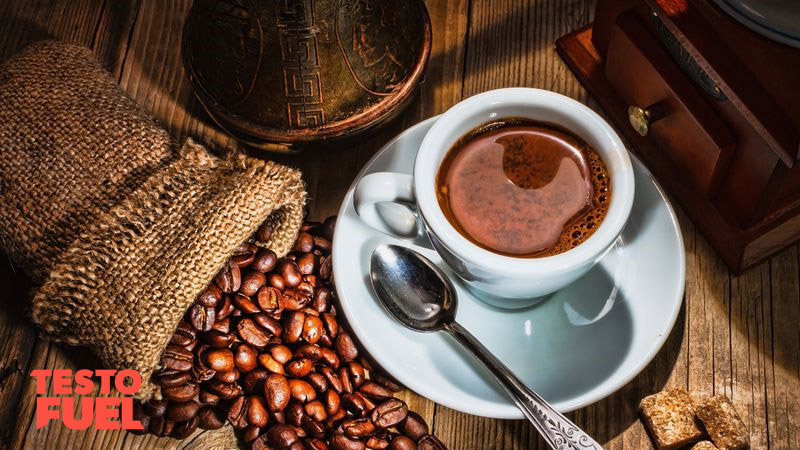 There are a number of studies that show caffeine can boost testosterone levels – even in the presence of elevated cortisol. First of all is this study published in the International Journal of Sport Nutrition and Exercise Metabolism . It showed that 4 mg of caffeine per kilogram of body weight was enough to boost T levels by over 10% in a group of professional rugby players. Cortisol was significantly lower than before the dose too. The group lifted more total reps of heavy weights for bench presses, squat and bent over rows – even if the athletes were tired or sleep deprived. Published in the European Journal of Applied Physiology , this study investigated the effects of caffeinated chewing gum on fatigue and hormone response in competitive cyclists. Each of the 9 volunteers completed 4 sets of 30 second bike sprints. Each set involved 5 reps. The volunteers were given either 240 mg of caffeine gum or placebo after the second set to see what happened. Performance of the gum group improved by 5.4% and fatigue was delayed too. But more importantly testosterone increased by 12%. Cortisol levels in both groups started to increase after the third set, but the addition of caffeine gum offset the increase by 21%. 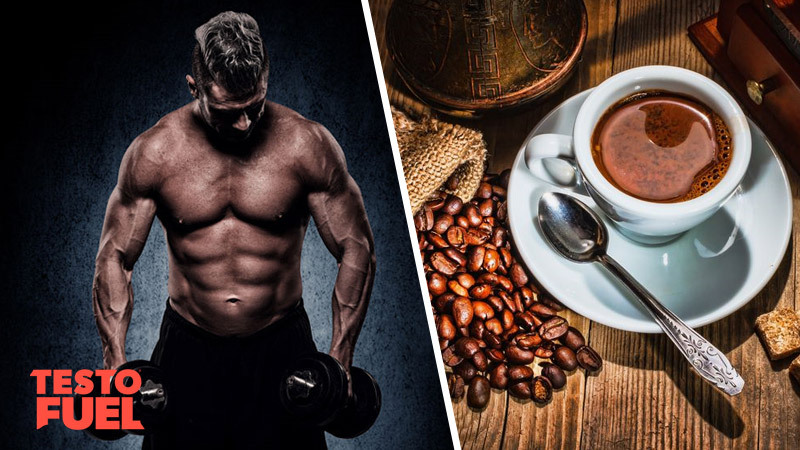 Another study, this time from 2008 , showed that caffeine taken one-hour before exercise increased testosterone in a group of 24 professional sportsmen. Athletes were given either a 0, 200, 400 or 800 mg dose and then T levels were measured at various points throughout a training session. The small dose of 200 mg boosted testosterone by a modest 15%, with the largest dose increasing it by a further 21%. However, the 800 mg dose also elevated cortisol by a whopping 52%. The researchers concluded that caffeine benefited the athletes and could lead to anabolic effects, but if the dose was too high it could be counteracted by the T-blunting effects of cortisol. What About Caffeinated vs Decaf Drinks? One interesting study from 2012 pitched two types of coffee against each other – caffeinated and decaf . 42 overweight volunteers were randomly assigned to 6-ounce cups of either beverage, and asked to consume one with each meal over an 8-week period. This meant one at breakfast, one at lunch and one for each evening meal. Caffeine was found to significantly increase total testosterone as well as decrease the T-blunting hormone estradiol at week 4. In fact the caffeine group reported T levels of 546 ng.dL versus 327 ng.dL in the decaf group. So it’s caffeine for the win every time. In conclusion, caffeine can be found in a number of products ranging from tea and coffee, to chocolate and kola nut. 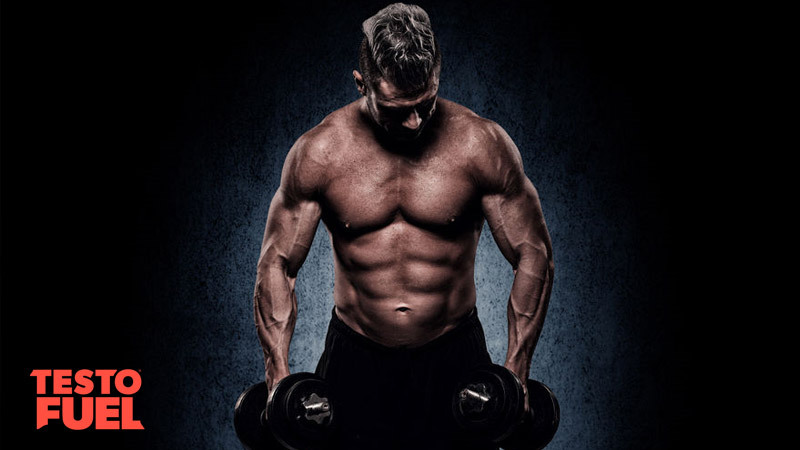 It is such as potent nootropic and performance-enhancing supplement that it forms a large part of pre-workout supplements, some stimulatory medications and also thermogenic diet pills. Although this compound can elevate cortisol, it has also been found to increase testosterone levels. Bear in mind though that more isn’t better – if the dose is too high then cortisol will increase too much, and blunt your male hormones. To maximize the benefits of caffeine you should consider ingesting moderate amounts prior to your workouts. This is the equivalent of 1-2 cups of medium-strength coffee.